Mr. President, Where are the nails and hammers? I always imagined the life of a former president as the perfect retirement. You sit around, exercise, read great books and get the best tables at the best restaurants. And when the bank account gets a little low, you give a speech to some group willing to write a check for a million dollars. And start the cycle over again, sit, run, read, eat, then work again. Not bad, right? I assume President George W. Bush is pouring over hundreds of lucrative offers. But I find this offer much more interesting. 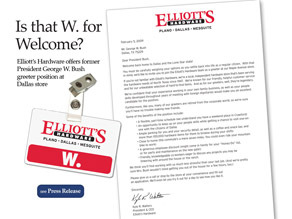 Elliott’s Hardware is a Dallas institution and just a few miles away from President Bush’s Dallas home. The store is offering the former president a job as a greeter. I know many of you are probably thinking this is a cheap publicity stunt. Perhaps, but it’s a good one. “It’s a sincere offer, we’ll make the arrangements,” Elliott’s P.R. man Jef Tingley told me. The company says the job perks include flexible hours, plenty of parking for security detail, short commute from his new home and it’s a low-stress environment to interact with people. I”ll leave the jokes to all of you. I’m just going to wish this actually happens. Jef Tingley tells me they sent the job offer to the President’s home earlier this week and still haven’t heard a response. Now, I’m sitting here looking at the phone number I have for President Bush’s office and wondering if should call Mr. Bush’s people and get a comment. Bush as a store greeter. What an image! Although to tell you the truth, Ed, it would make me think twice about doing business with that store. I doubt you need to call the Bush HQ for a comment. I bet Bush is working on his plans for his Presidential library and going to his ranch now and again to play cowboy. It is in my view that when people frustrated, they definitely go out to find someone who may comfort them. It is the way with all Presidents when politics turns tough for them. Isn't? Put jokes a side and start concentrate on what will happen when Obama decide to withdraw the IRAKIAN and American war.